Every whitetail hunter has experienced being unsuccessful and spent the off season wishing he could have changed his tactics and been more successful. However there is a silver lining, if the buck isn’t killed by natural causes or by a neighboring hunter, you will be able to watch his growth change from year to year. During the 2010 season there was a buck at The Proving Grounds, “Last Lick Big 10.” He was a giant buck for this part of the world. He showed all the signs of being mature, but he lived on a part of the farm where cameras had just started being used so his exact age was unknown. In 2011 “Last Lick Big 10” was back, but slightly smaller than he was the year before. 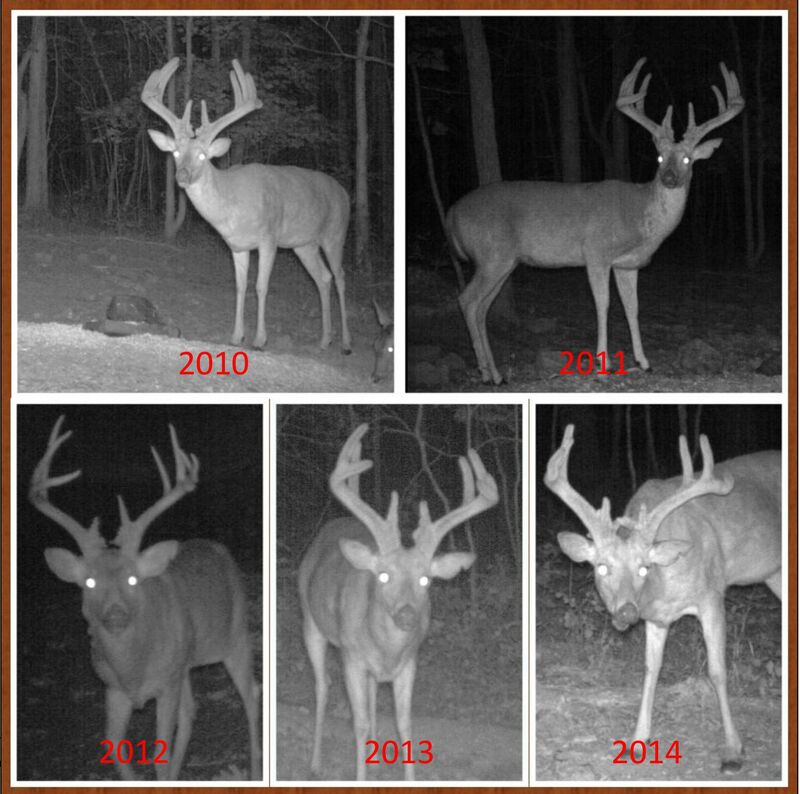 Over the last five years Two Face has lost several inches in antler but gained lots of character! During the following year of 2013, Two Face showed up on camera as a massive ten point with kickers at the bases of both antlers. He was a cool looking buck, but what made him show more character was his light colored face. His forehead was almost white and his back had scars all over it, most likely from fighting. During the off season this year I was looking through Reconyx cards and watched Two Face visit a Trophy Rock. He didn’t have antlers but our history is so strong I recognized him even without antlers. After years of running these hills and surviving predators and hunters, Two Face looks as old as the trees we hunt him out of. It was during this time I realized who he was. Two Face had decreased so much in antler size that at first I didn’t realize he is most likely “Last Lick Big 10.” They live in the same area; both have an ear notch in their left ear; and both have very similar antler dimensions. After studying all the photos we’re very confident they’re the same buck. That would make Two Face nine or ten years old! Watching Two Face over the years has been bittersweet. We’ve lost many battles with him in the game of hunting, but we’ve won by getting to watch such a magnificent buck live his life at The Proving Grounds. Two Face has been a great reminder to me that it’s not always about harvesting a deer but also the pursuit and the memories made along the way.